How to get a 360° visibility into your Azure Virtual Machine cost by family? If you are paying large bills for your cloud service with some extra charges which you don’t know about, then something is not right. There will be cases when you would want to get rid of your superfluous costs, but you are unaware of those hidden dollars that keep on adding up to your bills. One of the top players in the cloud computing space today is Azure providing a length and breadth of services, Azure Virtual Machine (VM) being the most widely used service. That’s where cloud visibility becomes an essential aspect of your cloud management practice. When every organization is moving towards cloud computing it still can be expensive if not used optimally. What is Azure Virtual Machine (VM)? Microsoft Azure Virtual Machine (VM) provides a highly scalable computing capacity. They are easy to start and stop and provide options to choose among different types of operating systems. It eliminates the need for upfront investment on the hardware, and you can develop and deploy applications on their servers faster. With your workloads up and running in Azure, your developers have 100% focus on innovation rather than being worried about the infrastructure management. You are given the flexibility to launch as many virtual servers as per your requirements and configure aspects like security, networking, and storage. How visibility of your virtual machine is important for optimum cloud infrastructure management? Azure Virtual Machine provides you with the highest flexibility and scalability. It helps you in the development and testing of your applications by offering a quick easy way to set up a computer with a suitable configuration for development and testing. In the development phase, your application requirements might fluctuate. Using Azure VM makes sense so that you can scale your VMs as per your needs. And, you only pay for them when you are using them. When not in use, shut down your VMs. 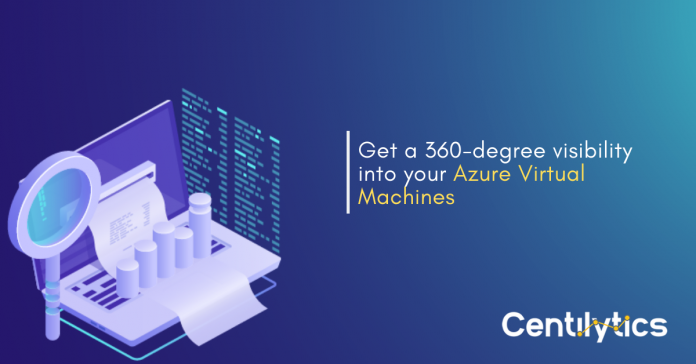 Azure VM pricing is based on the VM type that you select and how much you have used it on an hourly basis in case you have opted for on-demand service. Azure also gives you an option of Reserved Virtual Machine. Having subscription of VM or reserving them for 1 year or 3 years can reduce your bill up to 36%. Still, it is not efficient enough to make the most out of your VMs. Still, it is not efficient enough to make the most out of your VMs. 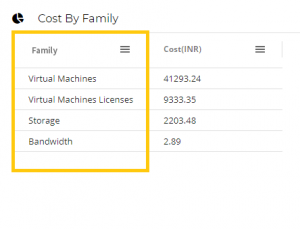 How Centilytics helps analyze your Azure Virtual Machine (VM) cost by family? 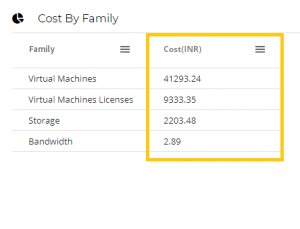 To achieve maximum efficiency and optimum usage of your Azure Virtual Machines (VMs), Centilytics brings you this insight called “cost by family” under Azure cost monitoring module. This insight gives you the details of all the instances you are using along with their cost incurred in a tabular as well as pie chart representation. Family: This column displays the individual family of your virtual machines in use. Families can be sorted in ascending or descending order of their price as per your preference. Cost: This column shows you the cost incurred by their respective families. It can also be sorted in ascending or descending order according to your preference. 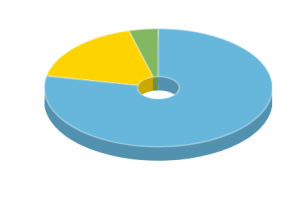 Pie Chart Representation: The “cost by family” insight shows also your VM cost against their respective families in a pie chart representation. If you hover on individual pie slices, you can see the family name, cost incurred by that family and the cost percentage share contributing to the total cost. Applying account Id filter will display data for selected account Id. This filter displays data for the selected resource tag value. For e.g. A tag named environment with a value say production (environment:production). Hence, users can see data of all the resources which are tagged as “environment:production”. User can use the tag value filter only when a tag name has been provided. Selecting this filter will display data after applying any applicable discount. This filter will set a custom start date and data will be displayed accordingly. This one allows users to view data in their time zone and is helpful in case of time and regional difference. This filter allows the user to view cost in exact decimals. For e.g., giving input ‘2’ will allow the user to view cost up to 2 decimal points. This filter allows you to choose between blended and unblended cost. A blended cost represents a unified cost that the user pays for a given service. It takes services such as Storage, Virtual Machine, Database, and several others into account. Whereas, an unblended cost represents a non-unified cost in which each type of usage with a specific rate gets its own line on the bill. Users can apply this filter to choose between options to either include or exclude refund (if applicable).